It was during the dark days of Watergate and the final, unsettling days of the Vietnam War, when actor John Wayne decided to speak out. 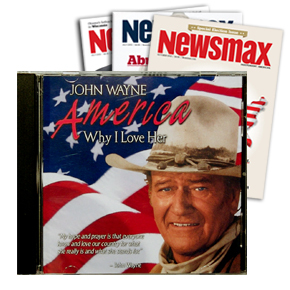 In "America, Why I Love Her," John Wayne explained in a special recording why America — and Americans — are special and why this country must remain great. Soon after the Sept. 11, 2001 attacks, the family of John Wayne decided to re-release this moving testimony by their father. More than 25 years after his death, John Wayne remains one of Hollywood's most popular icons ever and an enduring symbol of America. Actress Maureen O'Hara once said that no other description for John Wayne is necessary than this: "American." John Wayne's "America, Why I Love Her" is a must-have for all patriotic Americans, film buffs, collectors and poetry fans. It makes a wonderful gift and a great lesson for younger Americans. The CD is digitally re-mastered in surround stereo.